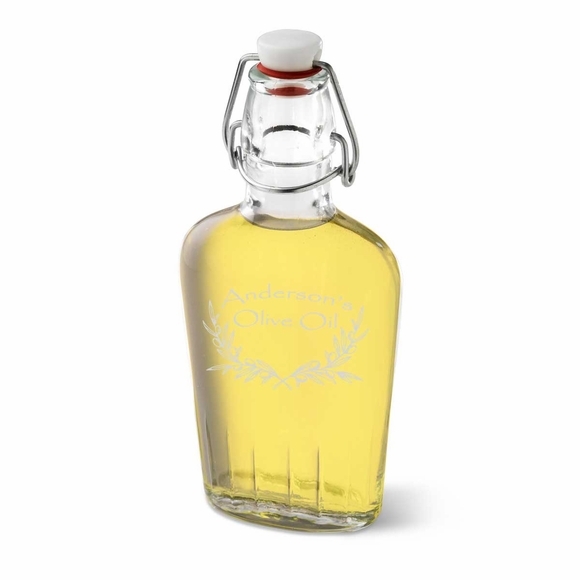 Olive Oil Glass Bottle - - personalized with the name of your favorite chef. Name is etched in a gentle arch above the words "Olive Oil" on the bottle front. Name line holds up to 15 characters (including spaces and punctuation). Corked glass bottle holds 8.5 ounces of olive oil. Dimensions: 3-3/4" x 1-1/2" x 8". Top personalized gift pick for a dinner or weekend host, Mother's Day, Father's Day, birthdays, and holidays.